4 strawberries washed and hulled. 1/4th of an extra ripe banana peeled and chopped. Add all the ingredients into a blender and churn till smooth. Pour into glass and serve immediately. 4 dates soaked overnight in less than 1/4 cup water. 1/2 tsp instant coffe powder. Add the dates along with the water in which it was soaked into the blender. Add all other ingredients. Churn till smooth. Pour into glass and serve immediately. Sending the Strawberry Banana Shake to ToRview's Event Food Palette-Pink. Cheers! Thank you for stopping by! I want both these glasses...but my fav would be dates mocha shake...got to give it a try. The date mocha shake sounds yummy! 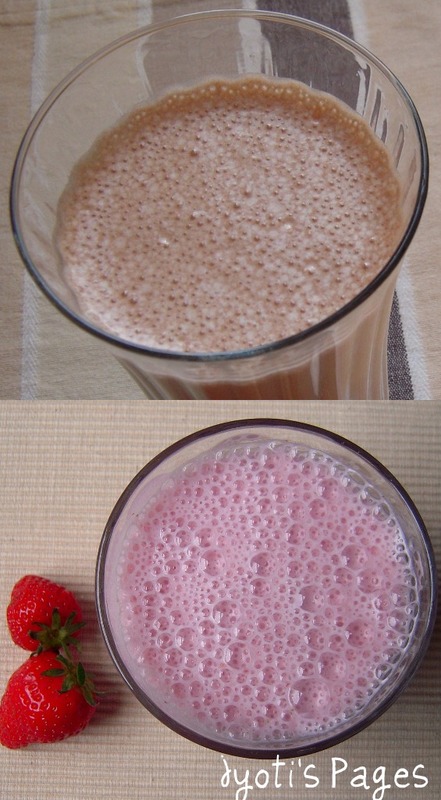 I would go for the strawberry shake(I dont like coffee).Looks yummy !. if i just have a shake fr breakfast ,I'd get ravenous in a few hours.. Thanks for the lovely drinks!.. Quotable Quotes from an old diary and Hobbies! Wordless Wednesday ~ Grey Sky! Mango Mania ~ Mango Lassi/ Mango Smoothie! Another Sketch and some pictures! !